Ideally you don't use tyre levers when changing tyres because there is always a risk of damaging the tube as you use the lever. Excessive force can even break the bead of a tyre. However, this can be very difficult in practice, especially with small wheels and tyres such as the narrower version of the Marathon Plus which have a thick anti-puncture layer and are not very flexible. It can also be difficult to get enough force with your fingers if you have to do this in the rain or on a cold day. For that reason, I carry a set of tyre levers with me in my touring toolkit and I sometimes use them at home as well. 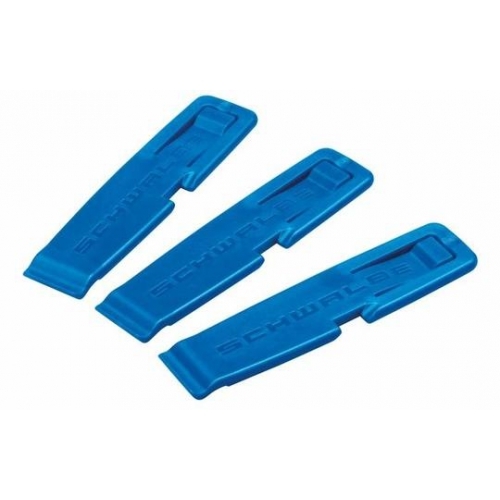 I've several pairs, but these Schwalbe ones work best. They're wider than many, and quite rigid, while being made entirely of plastic they are also very light weight to carry and less likely to damage the tube when you use them. Sold as a set of three, which clip together. Note: Tyre levers should only be used to help to loosen tyres from rims. They should never be used as levers to either fit or remove a tyre as this can cause damage. Tyres do no stretch and with the correct technique, you don't need a lever to convince a tyre to fit a rim.